Siestas and Cupcakes: The Stylish Blogger Award! Aw, shucks. 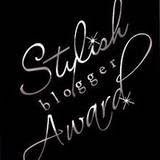 I got an award: The Stylish Blogger Award! Woohoo!!! Thank you to Melissa at From my somewhat serious mind for choosing me! There are rules to winning this award, I have to share 7 things about myself and then choose 15 other stylish bloggers to receive recognition. 7 Things you wish you never knew about me! 1) I wish I didn't love to sleep so much, but really, it's one of my favorite things. 2) I also love clever (Modern Family) and literal (Airplane!) humor immensely. 3) I enjoy traveling, and when I win the lotto I will become a full time jet setter. 4) When I hear a song on the radio, or wherever, I can remember what I was doing in that moment the song was out. I don't even realize it but it happens. 5) I need to live near water. Even if I go a year without going to the beach, I know it's there and that makes me happy. 6) I love being a homeowner and wish I had a good stash of money somewhere with which to decorate. 7) My favorite food is my Pop's bacon spaghetti. I can make it, but it's never as good. Phew, that was tough. People Magazine (or is it US?) has this section in every issue, 25 things to know about me for famous people. I think I'd have a hard time coming up with 25...no wonder some of them are silly! Now the fun part, passing the award to 15 other blogs! Please check them out and show them some love! Thank you so much for thinking of me! You're so sweet! I wish I could decorate my house with unlimited funds too!!! Bacon spaghetti? Oh my holy heavens. Can you give us the recipe or is it a highly guarded family recipe? I can't believe I never posted the recipe for bacon spaghetti! Ok, coming soon..! Thank you so much for the award lady! Yum, bacon spaghetti sounds yummy! I love Modern Family too. We watch it as a family every week. Thanks for the award:). I will post it next week.